“You will carry the Gospel of Jesus Christ to the World”…these prophetic words have laid the foundation for and continue to chart the life of Apostle R.D. Garrison Jr. Words spoken over his life by his father, the late Rev. Dr. R.D. Garrison Sr., over 47 years ago. Apostle R.D. 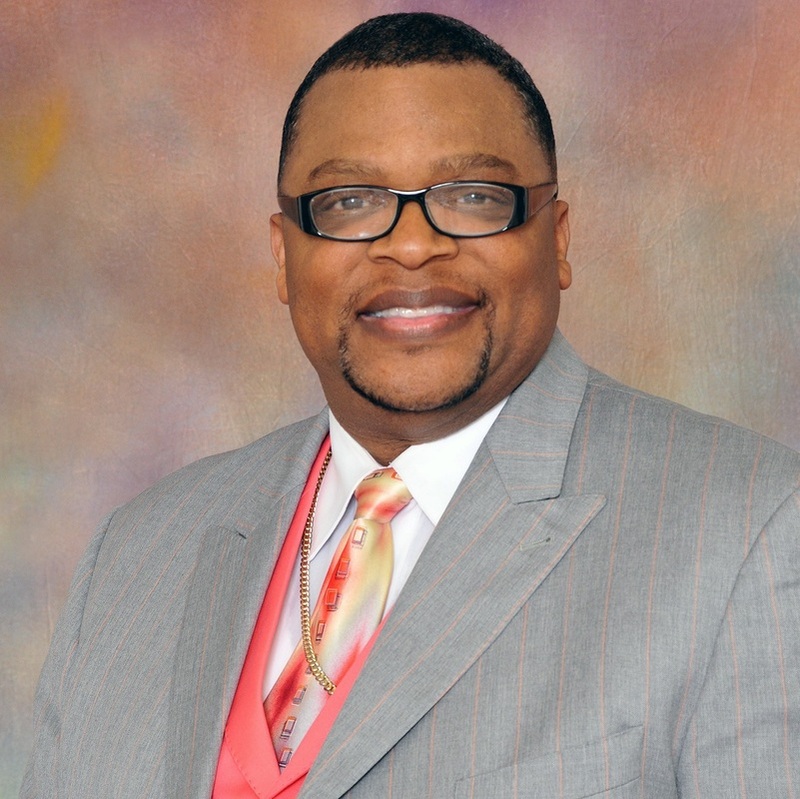 Garrison Jr., Apostle, Prophet, Pastor and Teacher, God’s Mouthpiece, Servant and Gift to the Body of Christ, entered this world March 6, 1963 to the late Rev. Dr. R.D. Garrison Sr. and Elder Verdie Garrison. Arriving as the tenth child to this blessed union, Apostle Garrison displayed unique giftings and abilities at a young age. His parents, like Hannah, prayed and asked God for a son and promised to indeed give him back to Him. They recognized the anointing and Call of God upon his life at an early age, thereby safeguarding the purpose of his life. While growing up, Apostle Garrison always knew and sensed personally that the Hand of God was upon his life. Not knowing the extent or magnitude of his calling, Apostle Garrison realized that there was something different about his young life. He attended Oakland Public Schools and is a graduate of Fremont High School class of 1981. He received advanced studies at Laney College, majoring in Classical Music and Psychology. Apostle Garrison accepted Jesus Christ as his Lord and Savior on May 25, 1979 while attending a youth retreat. The following Sunday during Holy Communion Service, he was baptized, filled with the Holy Ghost, acknowledged and accepted the predestinated Call of God upon his life to preach the Gospel of Jesus Christ. Not fully knowing the intersection of Time and Purpose was about to manifest, Apostle Garrison was licensed in 1979, ordained in 1981 and installed as Pastor of the Good Samaritan Baptist Church on August 15, 1982, by his father the late Rev. Dr. R.D. Garrison Sr. At the age of nineteen, slightly overwhelmed, Apostle Garrison knew the Call of God was upon his life to pastor. Surrounded by the love and support of his family, he was blessed by God to have these events occur under the administration and pastorate of his parents, the late Rev. Dr. & Mrs. Ross D. Garrison, Sr. founders and organizers of Good Samaritan Baptist Church of Oakland, Inc.
Apostle Garrison is currently celebrating thirty-one years preaching and twenty-eight years as Sr. Pastor of Judah The Gathering Place of Ministry Unto Jesus of Oakland, Inc., formerly known as Good Samaritan Christian Fellowship Church of Oakland, Inc. During his twenty-eight years of Pastoring, his greatest joy and passion is to teach and preach the Word and then watch God confirm His Word with signs following. He has preached extensively throughout the United States and internationally, having ministered in Australia, China, Thailand, Bangkok, Burma, and later this year (2007) he will travel to South Africa and to Nigeria. An Apostolic and Prophetic Voice called to the Nations! Apostle Garrison is the proud husband of the love of his life, his friend, and his “Boo”, Pastor Shannon Deonne Garrison. They are the blessed parents of Charles, Ashlee’, Joseph, Judah and Lanae' Camille Garrison, and their given daughter Carla Henderson, by the late Mother Doris Holloway. Collectively, their lives, ministry, love and unique blended strengths are making a lasting impact in the lives of men and women nationally and internationally. Psalms 37:23 is their favorite scripture, “Knowing your steps and stops are ordered by God, is the key to life’s success and happiness” and know that God will help you make the “Right Turn” in you life! The predestinated purpose of God for Apostle Garrison’s life continued to manifest. In August 1996, during the 10th Annual Judah Fellowship Conference of the Pentecostal Christian Fellowship Ministries, Inc., the late Honorable Bishop W. H. Bryant, Jr., Third Presiding General Overseer of the Church of the Kingdom of God, Inc., Albany, Georgia, consecrated Pastor Garrison into the Holy Office of Bishop. Seven years later, God allowed Bishop Garrison to enter another dimension of his predestinated purpose. On July 17, 2003, during the Fellowship of Deliverance Churches (FODC) Annual Convocation in Atlanta, Georgia, Bishop Garrison was anointed and consecrated as an Apostle of the Lord Jesus Christ, confirmed by the Laying on of Hands by Apostle Robert L. Vinson, Senior Pastor of The Samaritan House Church of Decatur, Georgia. Apostle R. D. Garrison Jr., was also appointed President of (FODC) during this time by Apostle R.L. Vinson, Founder of Fellowship of Deliverance Churches Inc.
Once again, God continues to ordain the steps of Apostle Garrison’s life. On Thursday July 20, 2006 during the 20th Annual Judah Fellowship Gathering Holy Convocation, God bestowed double honor upon Apostle Garrison. Apostle Garrison received two Honorary Doctor of Divinity Degrees. On January 1, 2006 The LORD led Apostle R.D. Garrison Jr., to change the name of the ministry after 51 Years (Gen. 32:22-32) from Good Samaritan Christian Fellowship Church to “Judah The Gathering Place of Ministry Unto Jesus of Oakland, Inc. A prophetic admonishment spoken to Apostle Garrison by his father, the late Rev. Dr. R. D. Garrison Sr., the day before his passing, “Son, promise me that you will take this ministry in whatever direction the Lord tells and lead you. You are the least of my worries; God has assured me that you are going to be very successful in the ministry”. A few days following the Home going Celebration, the Spirit of the Lord spoke to His servant this word “There shall be a gathering, and people shall come form far and near”. This was pondered in his heart and held in prayer for he next (14) months. From those words, the annual Judah Convocation Gathering was birthed and this was just the beginning. Over the past 25 Years, God has been preparing Apostle Garrison’s destiny and journey for this set and appointed time. Judah The Gathering Place of Ministry Unto Jesus is a place where anyone and everyone is welcome to come and experience the Power, the Praise, the Worship, the Word, and most of all the Personal Presence of Jesus the Christ, as King of Kings and Lord of All! “The Table Is Spread and the Feast of the Lord Is Going On” at Judah The Gathering Place! (Gen.49:10) “Where the Spirit of the Lord is, there is liberty! Apostle R. D. Garrison Jr., First Lady Elder Shannon Garrison and Judah The Gathering Place are on the cutting edge as one of the fastest growing ministries in the heart of the East Bay Area. Knowing what God has called and purposed them to do, as one of the fastest growing ministries on the cutting edge; we are also on the verge of relocating the ministry North East. A Vision God gave unto his servant, Apostle R.D. Garrison Jr., August 31st 2003. The site has been located……stay tune for the announcement! We are Excited about doing Kingdom Business in the spirit of excellence through Perfection! Apostle R. D. Garrison Jr., A Prophet, Pastor, Teacher, God’s Mouthpiece, and an Anointed Minstrel in Praise and Worship, Gift to the Body of Christ, Preaching the uncompromising Gospel of Jesus Christ in these last days, endeavoring to usher men and women to their destined call in God, fulfilling the prophetic word spoken over his life 47 years ago!